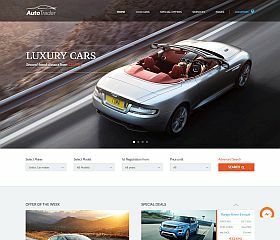 Auto Trader is the perfect WordPress theme for setting up a car blog, car dealership website, or online vehicle marketplace. Created for the automotive industry, it has been packaged with a number of exclusive features and extras like: an advanced filter (for make, model, color, etc. ), special templates and layouts for listings, advanced search functionality with custom search options, as well as a handful of other custom enhancements. 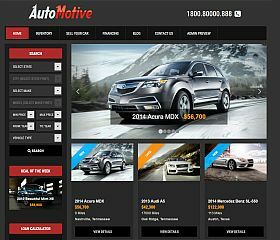 Automotive Deluxe allows you to create a vehicle marketplace, a car selling portal/directory, or a car dealership site – this complete solution gives you all of the features and functions you might need. Make money with your site by allowing visitors to upload their own listings and pay via the Paypal integration, display your vehicle inventory alongside powerful search functionality, and create a state-of-the-art car dealer site with all of the features you will find built into the theme. 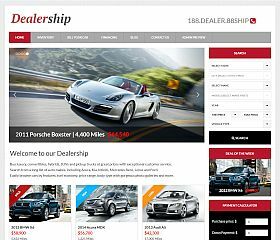 Car Dealer is a theme for creating an automotive blog or selling cars online, delivering a sleek and stylish design that’s sure to catch the attention of your visitors. The theme comes equipped with: a fully responsive layout and design that looks great on every size of screen, a featured slideshow gallery on the homepage, built-in shortcodes, and much more. 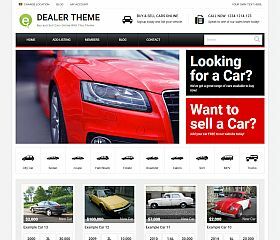 Car Dealer Theme is gives you a state-of-the-art website that would be perfect for any type of car lot or in use as a classifieds-style website. Features: payment gateway support, customization options, responsive design, Retina-ready, Google Maps and other geolocation features, make and model options, advanced search, allow users or dealers to add their own vehicles, user dashboards, membership/fee-based packages, upload multimedia, private messaging system built-in, and more. 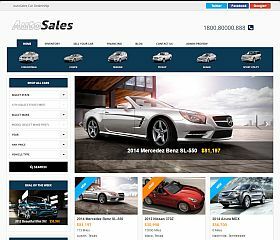 AutoSales Deluxe allows you to create a professional and easy-to-use car dealership/selling site with WordPress. 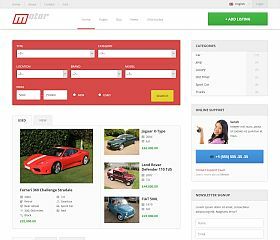 Easily list cars and vehicles for sale via the bulk uploader, present a beautiful site on all screen sizes with the responsive layout and design, and take your business to a whole new level with the amazing features that are packed into this theme. 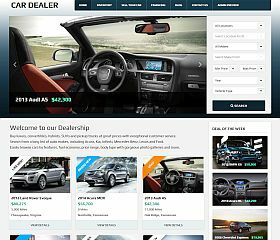 Car Distribution is a theme for WordPress that will give your car-selling business or website a truly unique look. The theme includes: custom page templates, custom post types, subtle animation effects, parallax design elements, lazy-loading of images, social media accounts integrated, responsive layout and design, built-in shortcodes (80+), built-in portfolio, and a handful of other great features. 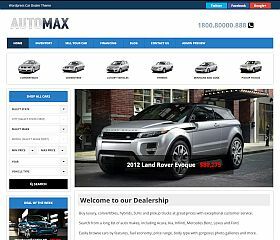 AutoMax Deluxe comes equipped with a clean design and features like bulk uploading, responsive layout, built-in finance calculator, theme customization options, and the ability to easily show your cars for sale – this theme provides a total package when you’re trying to set up a car selling and buying site. 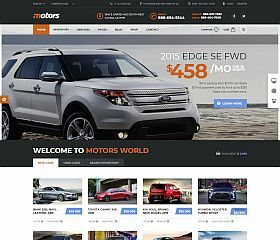 Dealership features the ability to bulk import and export listings, a responsive and mobile-friendly layout, unlimited color schemes and combinations to choose from, allow visitors to submit and pay for listings, and a built-in VIN decoder – this theme provides a complete solution for any dealership. Car Dealer is a theme for dealerships that includes: a database with every vehicle make and model, built-in loan calculator, ability to feature individual vehicles, custom search widget, special page templates for car comparisons and “watchlists,” extensive filtering and sorting functionality, multiple list layout options, ability to allow other sellers/dealers to set up their own account and post cars for sale, built-in currency converter, SEO optimized, as well as includes more than 20+ custom-built widgets. 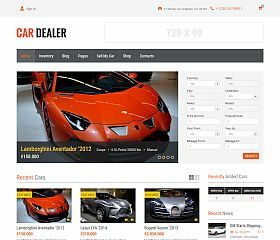 Car Dealer is a powerful and feature-rich WordPress theme that allows you to sell and list cars. The theme includes the ability to accept Paypal payments for post listings, a built-in VIN decoder, the ability to sort by vehicle features (including stock number), bulk upload of listings, Retina-ready, Craigslist posting code, a built-in financing calculator, and more. 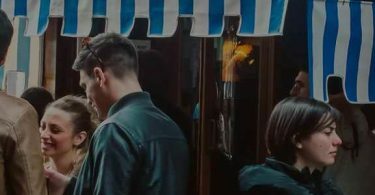 Tucana delivers a simple yet stylish design that is great for those with multiple locations – use as a business showcase or for manufacturers, it can adapt to many different styles. Inside the theme you will find it comes set up with: slideshow via custom post types, dynamic resizing of thumbnail images, custom page templates built-in, lightbox portfolio section, built-in shortcodes, widget-ready with more than a half dozen custom widgets, built-in AJAX contact form, and more. 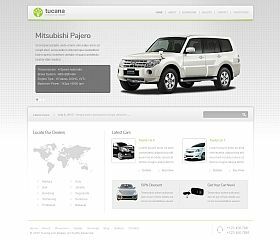 Auto Image delivers a striking and visually compelling design via a modern, full-width design. Included in the theme you will find: a retina-ready and responsive layout, support for WooCommerce, built with HTML5 and CSS3 as well as Bootstrap, Google Fonts integration, and more. 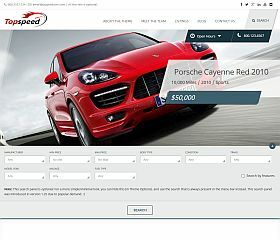 Top Speed can be used as a real estate site with the “Top Producer” layout, or for a car dealership site with the “Top Speed” option. The theme includes: customizable header, search/filter functionality, “listing” shortcode, dozens of theme options, visitors can compare listings, supports post format types, Google Maps integration with clustering and Street View, responsive layout, dark or light listing styles, custom page templates, boxed or full-width layout, and dozens more features. 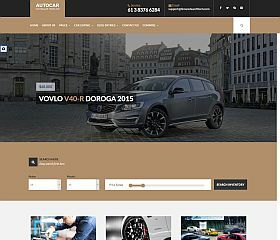 Automotive Car Dealership is one of the most popular WordPress themes of its kind on ThemeForest, with thousands of satisfied customers using it to power their website. This responsive them has been optimized for mobile devices and was built using Bootstrap, jQuery, and other modern development best practices. 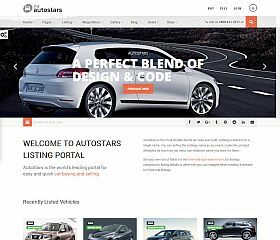 Auto Stars excels at creating a hub where visitors and dealers can showcase their vehicles for sale, create a classifieds-style portal or power your own car-selling website. It includes: listing management, built with Bootstrap, custom attributes, search listings, front-end listing submissions, eCommerce integration, dealer dashboards, allow visitors to see a variety of content (saved listings, searches, etc. 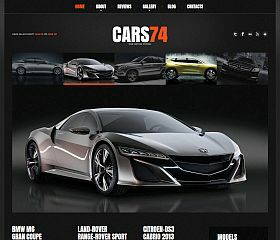 ), side-by-side comparisons, search for dealers, custom forms for listings, and dozens of other extras and enhancements. 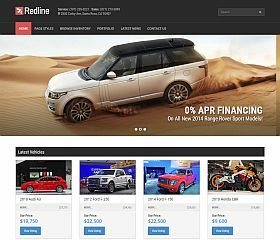 Redline is a car sales theme for WordPress provides you with an easy and professional way to get your auto business’ website up and running smoothly. 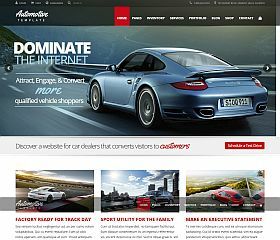 Equipped with everything you need for selling cars online, it includes: premium car dealership WordPress plugin (a $30 value), custom search filters, unlimited color schemes, Retina-ready, responsive layout, unlimited sidebars, built with Boilerplate and HTML5, PSD files included, and a modern design that is sure to convey your business professionally. Motor gives you all of the things you need to create a truly stunning vehicle marketplace online – whether you’re selling cars, boats, RVs, ATVs, motorcycles, or any other type of vehicle. Features: mobile-ready responsive layout, Revolution Slider WordPress plugin (an $18 value), shortcodes, support and integration with Contact Form 7 plugin, support for WooCommerce, video/media slider, coded with CSS3 and HTML5, and a theme options panel for customizing your look and layout. 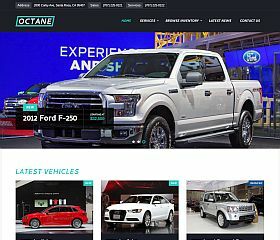 Octane is a modern and visually striking theme that was built specifically for car dealerships. 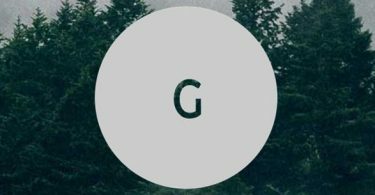 The easy-to-browse layout is optimized for speed, SEO, and all screen sizes – while providing a simple way for visitors to find exactly what they’re looking for. 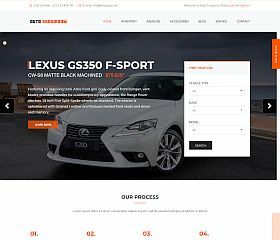 Features include: two premium plugins (Page Builder and Pro Car Dealership), unlimited color schemes, theme options panel, Retina-ready, built-in contact form, and more. 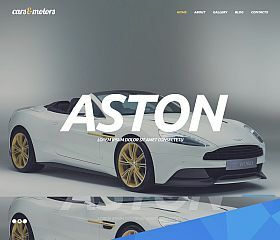 Motors is a versatile and multipurpose theme for WordPress that offers several different styles to choose from. Operate your site as a typical car or boat dealership, set it up like a classified site, or even as a mechanic/repair site. 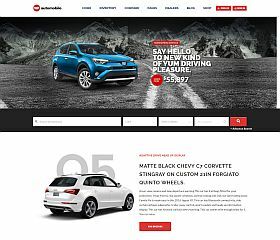 Auto Showroom is a modern and trendy theme for car, boat, and vehicle dealerships – it will give your automotive buying, selling, or leasing business a professional image. Included with the theme you will find tons of features like: an inventory manager built-in, color customization options, Bootstrap coding, Google Fonts integration, premium dealer plugin included, responsive layout and design, WooCommerce support/integration, and much more! 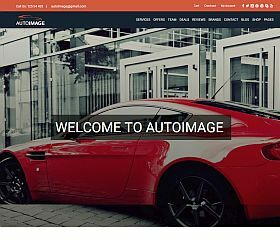 AutoMobile gives you everything you need to promote and manage your online business, from front-end submission of listings to the responsive layout and design, there are literally hundreds of features and extras that have been built in to give you complete control over every aspect of your site. Other features include: WooCommerce support, geolocation features, inventory types for makes and models, built-in finance calculator, “test drive” request, bookmarking system, featured listings, and more. AutoCar is equipped with all of the features you would want from a state-of-the-art theme for dealerships – it is responsive, includes 15 custom shortcodes, search box and filter, multiple listing views, and has been designed for speed and every screen resolution. 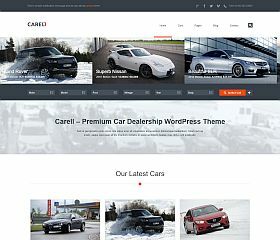 Carell is a dual-purpose theme for WordPress, functioning as either as a real estate or car dealership site. Features: 5 unique navigation styles, optional homepage sliders, fully responsive layout and design, Retina-ready, multiple layouts, optimized for speed and SEO, AJAX integration, custom widgets, built-in finance calculator, and more.